Total weight gain/loss: +2lbs, so that's 14 total. Sleep: so when I was thinking about this over the weekend, I was going to write: "well, this cold is certainly not making it easier... and I'm back to waking up twice a night to pee, plus half-waking a few times to roll over... but its not too bad yet" and then I slept like I was dead, without waking once Sunday night and last night! So, yay for that! 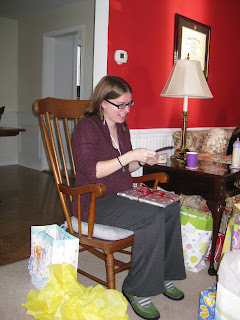 Best moment this week: my awesome baby shower! Movement: yup. big ones and small ones... pointy elbows and feet poking out. Food cravings: not much lately. Labor Signs: none so far, thankfully! Belly Button in or out? Um, flat... verging on outtie! What I miss: being able to easily put on socks and shoes, seeing my whole stomach! Lol. What I am looking forward to: Christmas, though that's not really baby related. But I look forward to every appointment, just love hearing that heartbeat (140s again yesterday). Weekly Wisdom: i have nothing. Milestones: after this, we're in the single digit weeks! Yay for seven months!! I can't wait to be there and in a few months I will be approaching that mark. I can't believe how much the first trimester is flying by now. I noticed your due date is February 23rd which is me and DH's wedding anniversary. We are due on June 23rd there must be something about the number 23 it is a lucky number!! Wishing you a wonderful week! Wow, time is just flying by! You look great. Check out my blog you have a blog award there!!!!! @Stumbull: My first blog award! Yay! Check back tomorrow afternoon, I'll post my 10 then. christmas cards! and an award! a cold, but not really complaining!